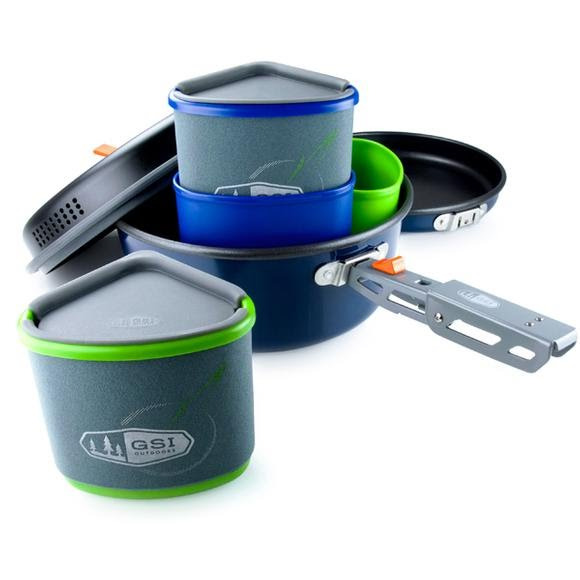 The definitive, integrated cooking and eating solution from GSI Outdoors for adventurers the world over, Bugaboo Backpacker Cookware offers a non-stick, nesting set of cookware for 2 with the innovative materials and design of Cascadian pieces that maximize space and allow food to be packed efficiently within the set. Amazingly compact design is fully equipped for the needs of 2 Gourmet Backpackers and can be extended to meet any Gourmet Camping needs. The recyclable, inexpensive answer to all your outdoor dining needs, Cascadian&apos;s lightweight, flexible material is easy to pack, stack and carry. Chemically-inert and BPA-Free, Cascadian pieces remain resilient in both hot and temperatures and are also extremely durable. Moreover, Cascadian pieces won&apos;t absorb food odors like other plastics and are completely recyclable at the end of their service life. Plus, they float! Dimensions (packed) 8.20" x 8.20" x 5.40"